Everyday Carry (EDC) – How I got into it and what do I carry? It used to be just “what I carry with me everyday”. Wallet, keys, phone. That was pretty much it. About a year ago, I unintentionally discovered the Everyday Carry (EDC) scene. It was when I had to replace my 7 years old bifold. I was thinking of a minimalistic front-pocket wallet. 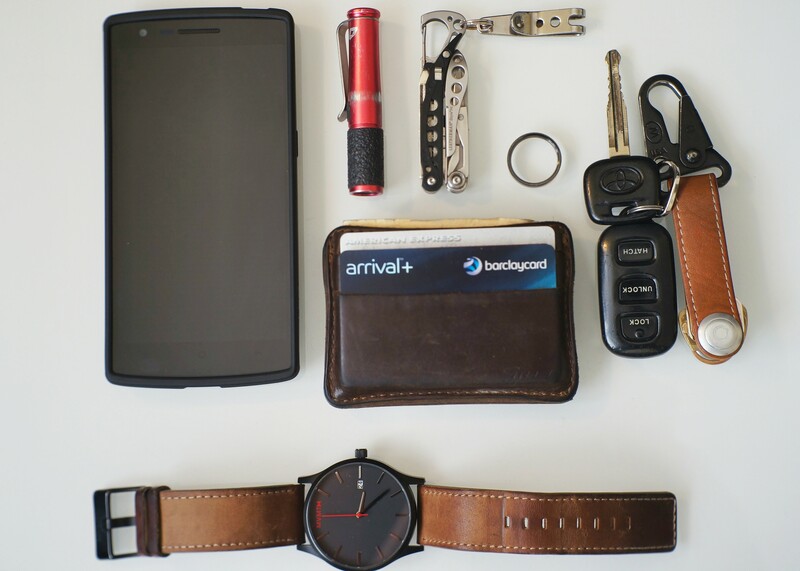 I hopped onto Google and searched “minimalistic leather wallet”, and after a few clicks from one review to another, I landed on EDC land and its friends (e.g., Carryology). Why carry all these things? I’ve had many people questioned my reasons for carrying a flashlight or a knife, but they are also the ones who “borrow” my flashlight and knife when they happen to need it. This is how I see it, do I want to be the person asking everyone else around me for what I need? Or do I want to be able to provide for myself? I’m not calling on a lone-wolf approach, but simply being responsible for my own need (and wants :D). Originally, I treated EDC just as a ‘fancy’ term for ‘what am I carrying?” However, I realize the fun of EDC is the optimization of it. For example, keys. The standard keyring system allows us to carry all of our keys in a loop. It can then be thrown inside a pocket, a bag, or attached to a belt loop, usually via a carabiner. There were several things that slightly irritated me about this system. Noisy – it creates a lot of noise if it is just suspending from a belt loop. POSSIBLE SOLUTION: Put it in a key holder (leather pouch kind of thing) that is soft. Comfort – when I do need to put my keys in my pocket, it was very uncomfortable. Unorganized – I had 9 keys in total, and even though I added some color tag onto my 2 main keys (home and work), the task of picking out the key I needed was still not very efficient. DQ-ed POSSIBILITY: Multiple sets of key. I banned that idea without even trying. It complicates my system. Ugly – just…doesn’t look good? POSSIBLE SOLUTION: Some kind of key organizer, again. These are things I find to always be on me no matter where I go. Wallet, flashlight and knife in right front pocket, keys hanging from a belt loop, phone in left front pocket. Empty backpockets for whatever I need to put there in temporarily.